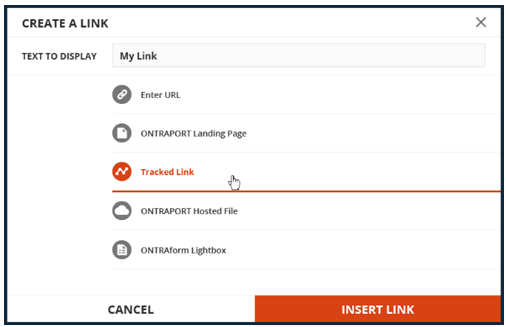 ONTRAPORT Tracked Links are a powerful automation tool that can be used nearly anywhere online to gather statistics, activate Campaign Triggers, Goals and even legacy Rules. You create a Tracked Link by providing a destination URL for the link. When your contact clicks a Tracked Link they first visit the ONTRAPORT servers and are then redirected to the destination URL. 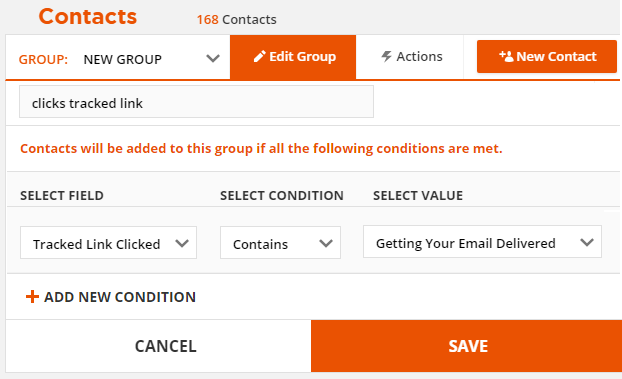 ONTRAPORT not only tracks the link click in the Contact Record, but also in the Tracked Links section. ONTRAPORT already tracks regular links in emails, and links that lead to ONTRApages, so what is the benefit of a Tracked Link? Tracked Links can consolidate statistics from all sources, including emails, landing pages, display ads, and other media. You can include a Tracked Link in multiple email messages, on different landing pages, and other online media and not have to remember to add another Trigger or Goal to your Campaign. You can change the destination URL at any time in ONTRAPORT. If you have a membership offer, and you change URLs, you don't have to go back and edit the link in multiple email messages (or even try to remember where the link is on other online media). In ONTRApages, ONTRAmail, ONTRAforms, select the text, button or image that you would like to hyperlink. Click the hyperlink icon. The Create a Link dialog box appears. Select Tracked Link. You can use any existing Tracked Link shown, but we'lll create a new one by selecting + New Tracked Link from the dropdown menu. Enter a name and insert the destination URL. Click Save and confirm the new tracked link is selected. Click Save on the Hyperlink. Enter a Destination URL. This is the URL that your tracked link will take you to when clicked. Copy the Tracking URL Code and paste it where you would like the link to appear. Note that it is standard HTML link code and can be used on virtually any web page. 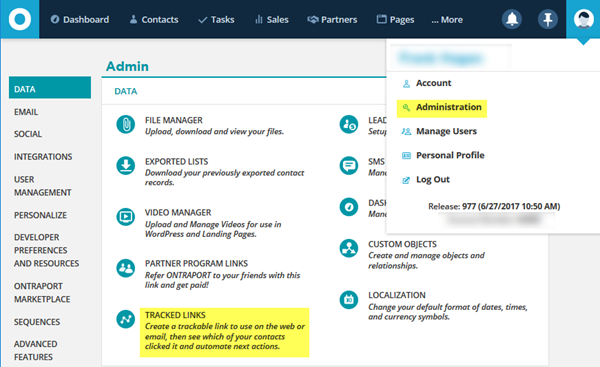 If you don't see Tracked Links in your Administration area, you may not have adequate user permissions. To check if your user seat has permission to see the Tracking tab, check out this article and ensure the Marketing checkboxes are marked. You may need an administrator of the account to adjust the permissions. Automation for Tracked Links should be initiated by a Campaign, rather than by using a Legacy Rule. Legacy Rules work in a similar fashion to a Campaign's Triggers or Goals, but are harder to maintain as time goes on. Keeping all automation on your Campaign, rather than in Legacy Rules, provides better visibility. Click to open the Trigger at the top. You can elect to populate the existing Triggers and add the "Clicks Tracked Link" trigger, or delete them and use just the "Clicks Tracked Link" trigger. Note the Wait element just below the Trigger. It is preconfigured to wait one hour after the Trigger to see if a product has been purchased. You can increase that value if desired. Configure the rest of the elements in the Campaign to send the nurturing emails. You may want to include a Personal Coupon code in the emails to encourage a purchase. 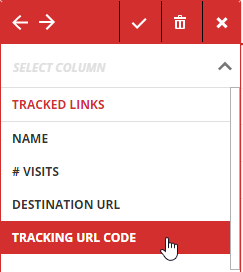 Suggestion: Make "Tracking URL Code" (the actual link you paste into your email or website in order to track clicks) a column, rather than something hidden under the Actions menu? It would be useful to be able to search the page for a particular link to find out what it points to, if you come across it later in an email or on a page. Also, it seems like an extra step to have to click the checkbox, then Actions, then Get Link Code, then select & copy, then click Close. A lot of steps when it could just be highlight & copy. Heck, you could even add a one-click "copy to clipboard" button as a column. Question: How long does it take for rules that run when a tracked link is clicked to fire? I'm looking about 5 minutes after clicking, and the click shows up in the contact's history, but on the link tracking page, it still shows 0 clicks, and the rule has not fired. Is there a delay that should be expected? Well, I sent my comment a second too soon—the rule fired, contact was added to sequence, and click was registered 6-7 minutes after click. Thanks for your comments, Justin! The Rule will wait until the Contact record shows the link click in this case, so there can be a 5 - 10 minute delay. Usually it will act within five minutes. We added a usecase today under "What You Can Do with Link Tracking" that a customer shared with us ... a "cart abandonment" type of process for testing when a tracked link is clicked and comparing that against the purchase history in the contact record. It's a pretty powerful feature! in Step 2 d) I'm not sure what that means.. "Replace the link on your web page with the code provided"
would this be in wordpress? HI Julie - That is an awkward sentence! Let me see if I can clarify it. In step 2.c you are copying the new link code to the clipboard. Step 2.d. should probably say "Use this link anywhere on the Internet, or in email, etc." You can place this link anywhere, on your web page, a WordPress page, in an email, etc. No matter where this link is placed, when it is clicked the person will be directed to the URL you set for the link in the earlier steps. In that respect it works like every other link on the Internet. Click it and you visit the URL in the link. The value of the Tracked Link is that we can track it and act on it; a Rule can run whenever a Contact clicks that link, no matter where on the Internet they found the link. thank you that makes more sense! Question: How can I add URL forwarding? What should I add to my new ontraport link? You can change that destination URL any time you like by clicking on it and then editing it. Because it takes 6-7 minutes for the trigger to fire, this can cause an issue with the abandoned cart campaign. Since it often takes less than 6-7 minutes to enter a credit card number and hit submit, often the purchase is made before the contact is added to the campaign. Then the because the campaign doesn't look back over the past 10 minutes it believes no purchase has been made and leaves the contact in the cue. This results in customers getting an email after they have received a purchase receipt. At times I get an email back from them, confused about what is going on.